It’s hard to resist the opportunity to hike up to a world-famous landmark. 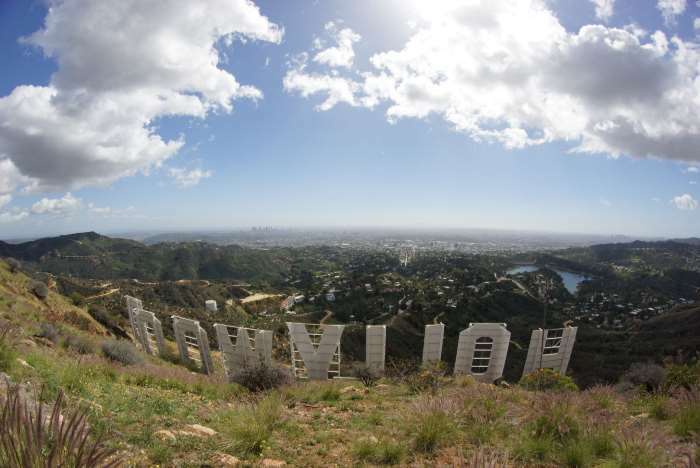 The Hollywood Sign, which looms over Los Angeles, is recognized worldwide. And while you can’t access the sign directly (without risking a hefty fine and imprisonment), you can get pretty darned close, and see the sign from just above and behind the giant letters. There are a few hiking options — on this page we’ll discuss the path that’s not too short, and not too long — it’s just right. 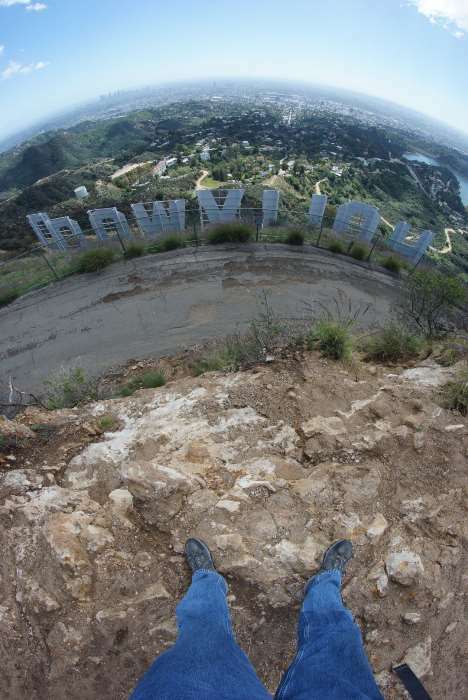 The shortest and most straightforward hike to the Hollywood Sign on Mount Lee begins at the end of Beachwood Drive. However, as of 2016, on-street parking is not allowed near the trailhead on weekends. As an alternative, you can take the hike described on this page. 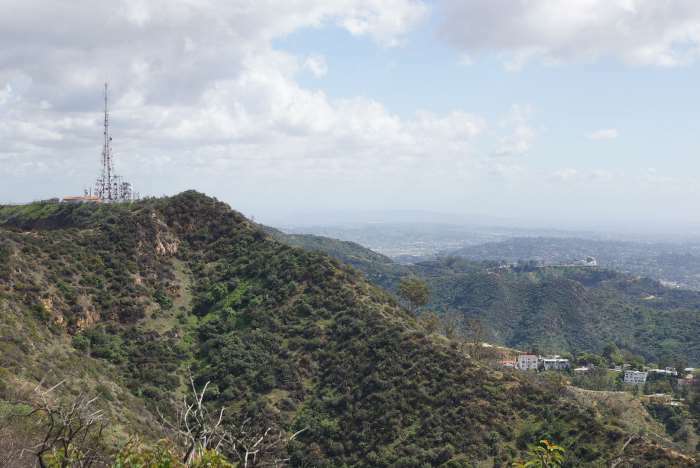 From the Hollywood Freeway, take Barham Boulevard, then turn right on Lake Hollywood Drive. 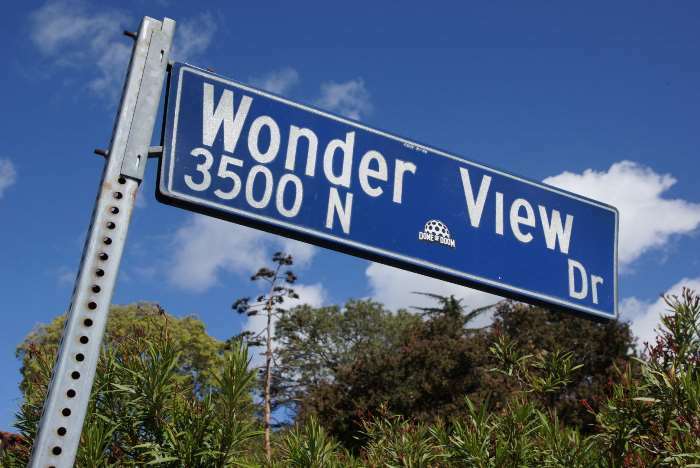 When you reach Wonder View Drive, turn right and park along the street. (Wonder View Drive dead-ends, with no turnaround, so make sure you make the turn.) There is plenty of parallel parking in this area. 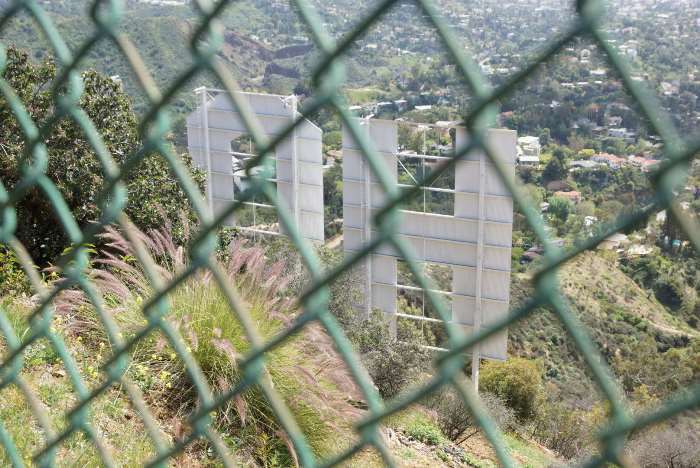 I had hoped to hike up to the Hollywood sign for years. During a visit to California in 2010, I became hopelessly mired in a traditional LA traffic jam, keeping me far from the trailhead until it was far too late in the day. And again on this trip in 2016, on the first day I lost too much time once again, getting across town and to a trailhead. So, when the next day came, I decided to devote all of my efforts to beating the traffic, arriving early, and enjoying a nice hike. This time, I had a plan. 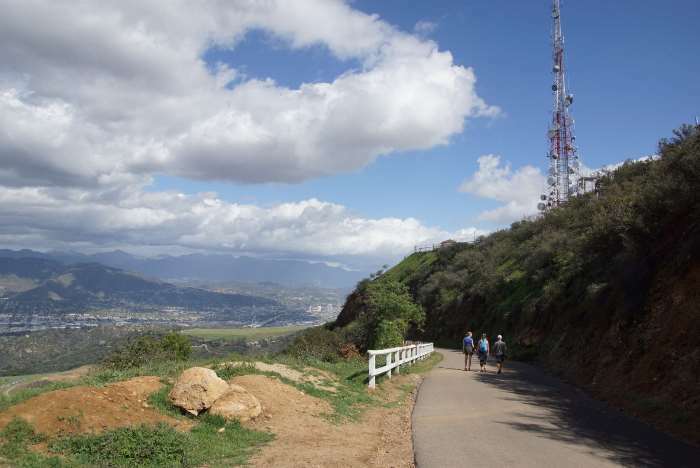 I knew that I couldn’t take the easiest path (at the end of Beachwood Drive) due to weekend parking restrictions, so I headed over to the Wonder View Drive trailhead. 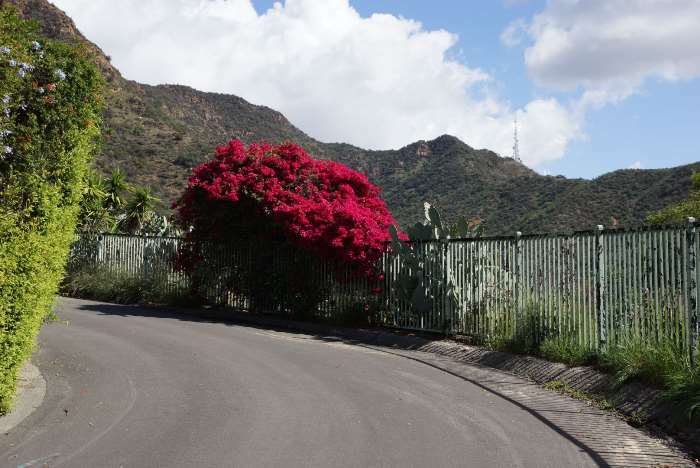 … you walk up beautiful Wonder View Drive to the end. 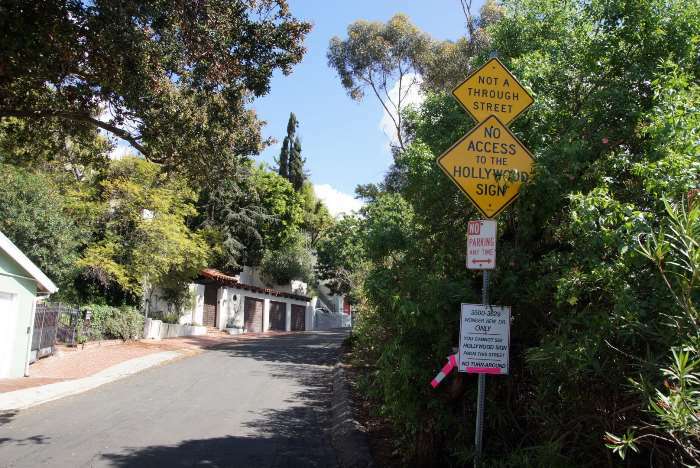 A sign warns that there is no access to the Hollywood Sign — and I suppose that’s true, for vehicles. But, on foot, this is the way to go. And, you can even see the very edge of the H from the start of the trail. Wonder View Drive ends underneath some very un-wonderful power lines. It looks like, at one time, you could park here to access the trail, but now the parking area is off-limits. 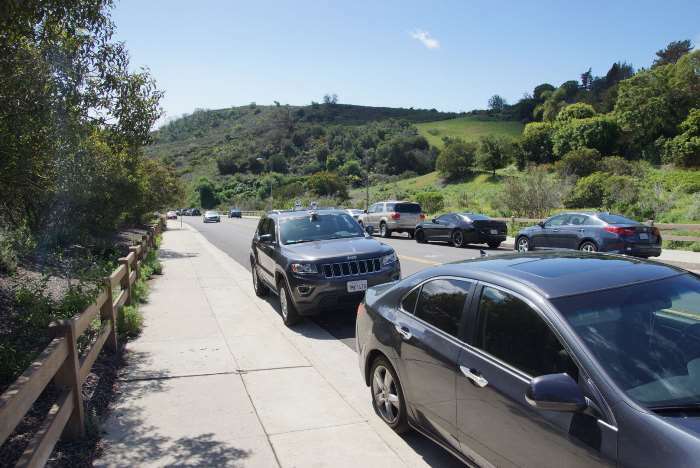 Don’t even bother driving up Wonder View Drive — it’s narrow and u-turning is difficult. As you start up the trail, you already have a view of where you’re headed. 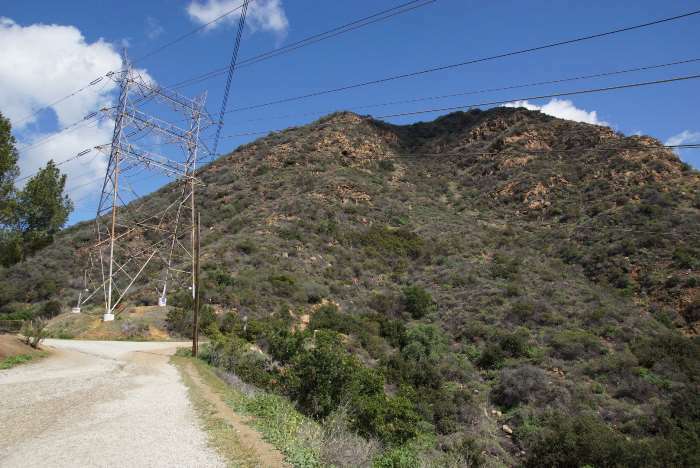 Keep an eye on that radio tower — it’s the familiar structure you’ve seen a million times, directly behind the Hollywood sign. 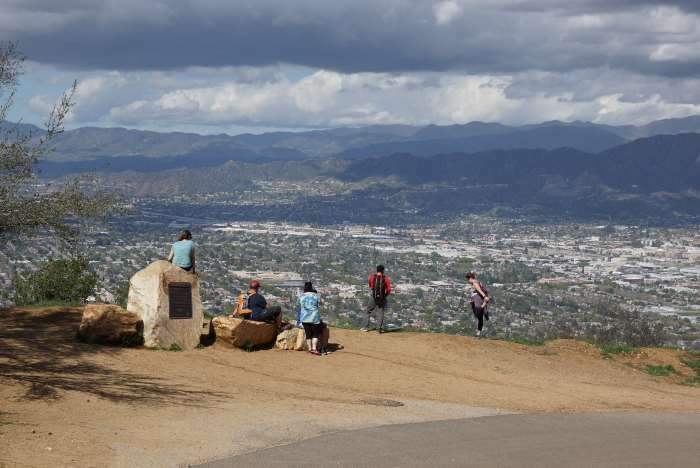 You’ll also have occasional views looking over into Burbank and the San Fernando Valley. 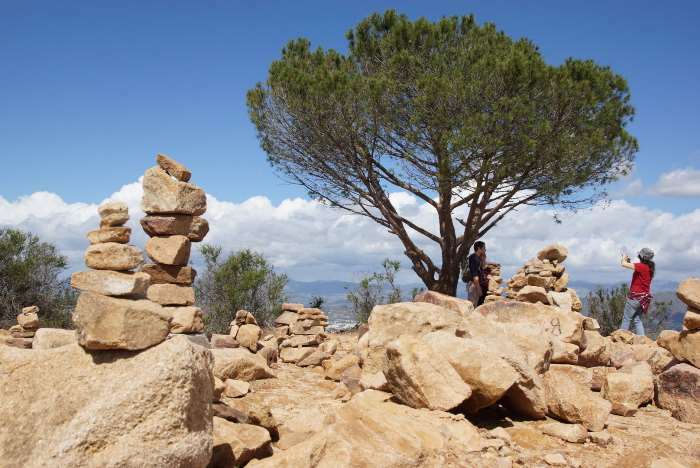 It’s a pretty vigorous uphill climb to the first reward: the Wisdom Tree. This is a fun stop, not only because of the lonely tree atop the hill, but also because of the hundreds of cairns piled up by visitors. Many have notes left underneath the rocks. 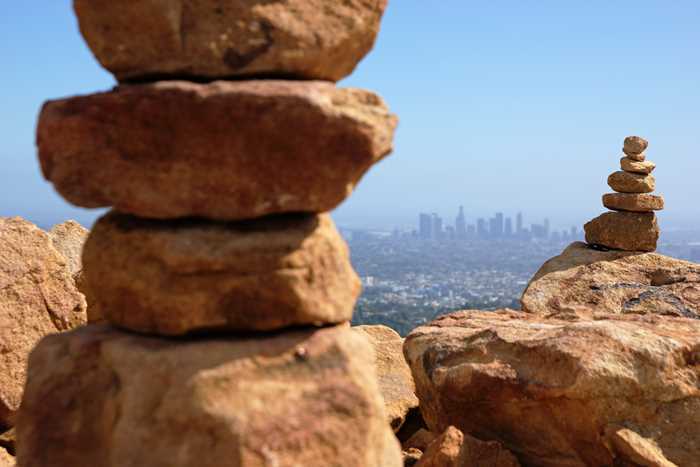 You’ll also find excellent views of downtown Los Angeles — at least, as good as the views get, through the LA haze. As you leave the Wisdom Tree, the trail runs along the crest of the mountain. That’s good, you might think — no more hill climbing. Well, not exactly. 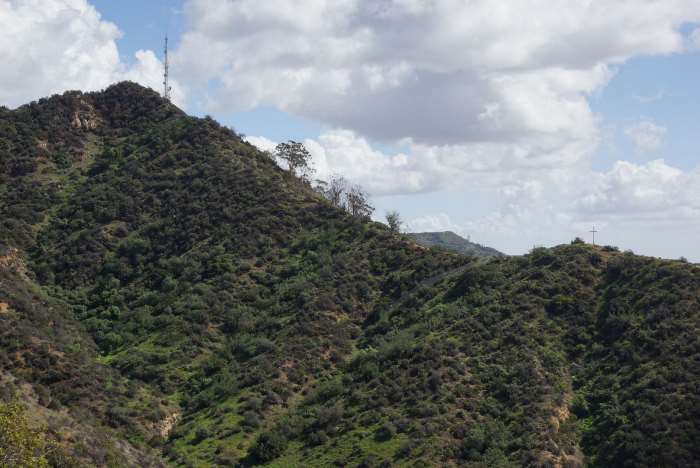 There are two or three humps in the ridge — you can sort-of see one of them in this picture (Cahuenga Peak). You have to go up and down each one. None of them are a huge challenge, but they do require some effort. On the last hump, you finally find the view you’ve been waiting for. 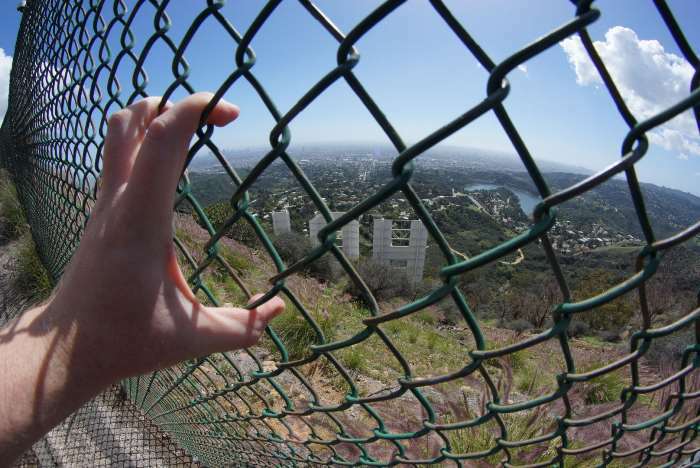 The HOLLY portion of the Hollywood sign is right there in front of you. By the way, this spot is known as the Hugh Hefner Overlook. 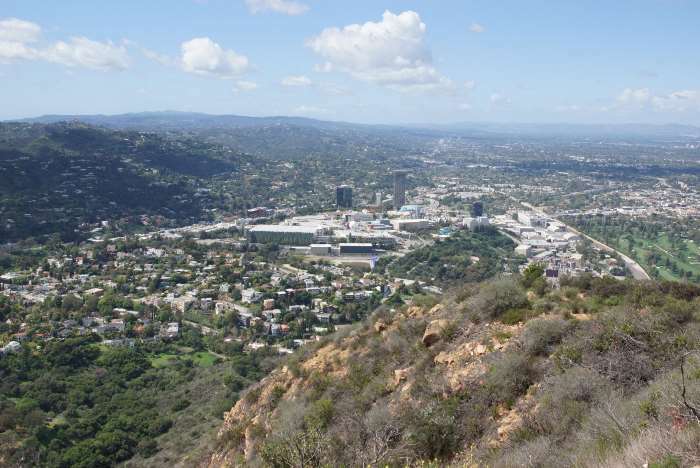 Hef was one of the big donors who helped buy Cahuenga Peak, a few years back, when it was at risk of being sold to developers. Once you’re on the paved road, you get to walk directly behind the sign itself. 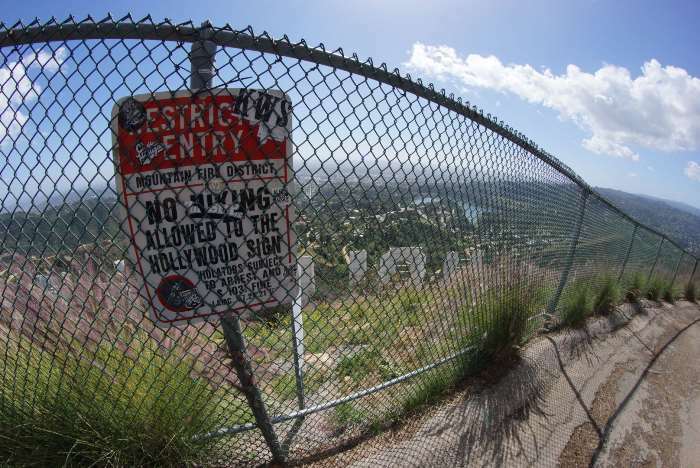 A chain-link fence protects the sign from vandals, along with numerous security cameras. Speakers blast some sort of white noise (I don’t know if it’s to scare away birds, or if it’s some sort of intercom system that allows cops to yell at trespassers). With a wide-angle lens, you can reach over the fence and take a picture of the entire sign. But, without one, it’s hard to get the entire sign into one picture. Fortunately, there’s an even better viewpoint. …where you can take all the foot selfies your heart desires. … and of course, the paved road that would take you down to Beachwood Drive, if you had been allowed to park there. 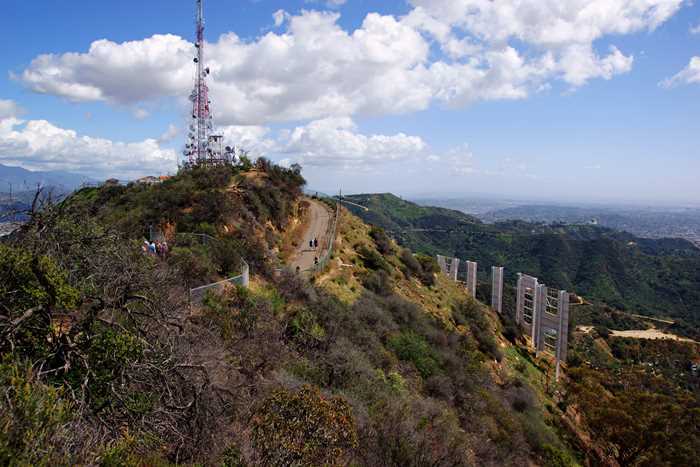 The hike up to the Hollywood Sign and back down took a total of about three hours. Of course, you could do it much faster if you did less picture-taking and sightseeing along the way. Expect to climb about 800 feet in elevation — but keep in mind, as you go up and down each hump, you’ll gain some of that elevation over and over again, making the trail slightly more challenging.